Ready for some sports betting? Get a 100% Deposit Bonus at WagerWeb.com! The Georgetown Hoyas already have to replace reigning Big East Player of the Year Otto Porter in this upcoming college basketball season, and now it appears the team also could be unexpectedly without another starter, Greg Whittington. The 6-foot-8 sophomore forward suffered a significant knee injury last week and could be out for the year. The extent of the injury, as well as how much time he will miss, is still undetermined, however. Whittington averaged 12.1 points and seven rebounds last season before being ruled academically ineligible prior to the St. John’s game on Jan. 12. He played 13 games this past season after being ruled academically ineligible. Georgetown coach John Thompson III has said that Whittington would return to the team after missing the final 19 games of the season. The Hoyas finished 25-7 last season, tying for the Big East regular-season title, and lost to Florida Gulf Coast in the NCAA Tournament first round. The teams returns returns starters Markel Starks, Nate Lubick and D’Vauntes Smith-Rivera and will also add UCLA transfer Josh Smith after the first semester. Smith was once a dominant player at UCLA but conditioning and effort issue have prevented him from reaching his full potential. The versatile Whittington was set to take over Porter’s small forward role, where Aaron Bowen, Stephen Domingo and incoming freshman Reggie Cameron could also receive minutes. Georgetown will open the season against Oregon in the Armed Forces Classic on Nov. 8 on ESPN at an Army base to be announced. Oregon finished the 2012-13 season with an overall record of 28-9, winning the Pac-12 Conference Championship. The Ducks advanced to the NCAA Championship Sweet 16 as a No. 12 seed knocking off No. 5 Oklahoma State and No. 4 Saint Louis, before falling to eventual national champion and top-seeded Louisville. The Hoyas will play in the new Big East with six other former Big East schools, as well as newcomers Butler, Creighton and Xavier. The Georgetown defense should be dominant again. The team brings back 82% of its minutes from one of the nation’s best defenses. Opening Day in men’s college basketball will be Nov. 8 at American Airlines Arena in Dallas and will feature four games: Baylor vs. Colorado, Texas vs. LSU, SMU vs. TCU, and Alabama vs. Oklahoma. The arena, the home of the NBA’s Dallas Mavericks, is just 18 miles from Cowboys Stadium, the site of the 2014 Final Four. If this event is a success, look for similar tip-off events at future Final Four sites. Nov. 8 is a Friday, the day before the huge Alabama-LSU football game at Bryant-Denny Stadium. Oklahoma is coming off a 20-12 season that ended with a 70-55 loss to seventh-seeded San Diego State in a first-round NCAA Tournament game in Philadelphia. The Sooners were seeded No. 10. Alabama went 23-13 last season before losing to Maryland at home in the NIT quarterfinals. In Coach Johnny Jones’ first year at LSU, his squad won 19 games but missed out on a postseason berth. The Tigers will be fortified in 2013-14 by an incoming recruiting class ranked in the top five nationally. Texas went just 16-18 last season including a loss at Houston in the CBI postseason first round. SMU, coached by Larry Brown, was 15-17 last year. TCU was 11-21 in its first season in the Big 12 but did upset Kansas. The top game will be Baylor vs. Colorado, a former Big 12 matchup. Both should open the season in the preseason Top 25. Baylor brings back the majority of a squad that won the NIT championship and tout two future NBA players in Isaiah Austin and Cory Jefferson. Colorado’s backcourt of Askia Booker and Spencer Dinwiddie will be one of the nation’s best, while forwards Josh Scott and Xavier Johnson were two of the country’s top freshmen last year. Colorado defeated Baylor last season in the Charleston Classic and went on to earn a berth in the NCAA tournament. Kansas coach Bill Self has lured the best recruit he has ever gotten to Kansas as consensus No. 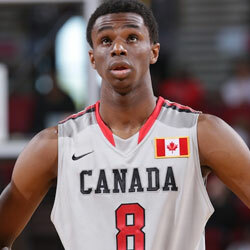 1 overall high school star Andrew Wiggins has announced he will attend KU this fall, picking the Jayhawks over Florida State, North Carolina and Kentucky. Grant Taylor, a reporter in Huntington, W.Va., where Wiggins attended prep school, was the only media member allowed to cover the ceremony in which Wiggins made his announcement that he will be going to Kansas. According to Taylor, Wiggins mentioned KU head coach Self and assistant coach Kurtis Townsend. Wiggins could turn Kansas into a top five team and fill the major void left by NBA-bound star Ben McLemore and All-American center Jeff Withey. McLemore was similar in some ways to Wiggins, a big, athletic shooting guard or small forward. The void of McLemore leaving can create a nice presence for Wiggins. KU lost all five starters off last year’s team. Wiggins slots in as a likely starter alongside soon-to-be sophomore power forward Perry Ellis and junior guard Naadir Tharpe. Wayne Selden, a McDonald’s All-American combo guard, could also project as a freshman starter, while incoming freshmen guards Conner Frankamp and Brannen Greene and center Joel Embiid are all ranked among the nation’s top 40 recruits. Incoming point guard Frank Mason is also ranked in Rivals.com’s top 100. The decision also burnishes Self’s credentials as one of the nation’s best recruiters. Wiggins is the fourth top-10 player, according to Rivals.com, to be recruited to Kansas by Self. The others: Julian Wright, who was No. 8 in 2005; Xavier Henry (No. 8 in 2009); and Josh Selby (No. 1 in 2010). Florida State had been involved the longest with Wiggins, and both of his parents went there. His dad was an NBA player, his mother an Olympic track star. The Seminoles were the early favorite. Kentucky was connected to him for a long time, and seemingly every elite recruit is joining John Calipari’s Wildcats nowadays. North Carolina gave Wiggins a chance to be the go-to-guy off the bat, and there are area ties to his family. Kansas made up a lot of ground in the latter parts of Wiggins’ recruitment, after being something of an afterthought during the early stages. Self made a major impression on Wiggins, and he loved his visit to Lawrence. Wiggins has a chance to be the go-to-guy right off the bat, and he could be the missing piece between a borderline top-25 team and a Final Four contender. Throw in the fact that Wiggins’ brother, Nick, plays at nearby Wichita State, and it made sense for Kansas to put on the full-court press. Wiggins is immediately a leading candidate to be an All-American next season, as he is also the heavy favorite to be the No. 1 pick in the 2014 NBA draft. The 6-foot-8 small forward has the ability to play multiple positions, creating matchup problems all over the court. No team has repeated as college basketball’s national champion since the University of Florida in 2006-07, so the odds are stacked against the University of Louisville as it is. Rick Pitino’s Cardinals for sure are losing senior guard Peyton Siva, which is a big loss. 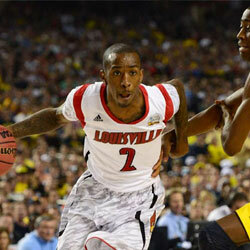 And apparently Louisville also will lose star junior guard Russ Smith as he is declaring for the NBA draft . Russ Smith Sr. told SI.com during Monday’s on-court celebration that his son Russ will turn pro. Russ Smith Jr. led Louisville in scoring this season. Smith Jr. is nicknamed “Russdiculous” by Louisville coach Rick Pitino for his penchant for taking crazy shots. Smith struggled in the national championship game win over Michigan, missing 13 of 16 shots, but he scored at least 20 points in the first five games of Louisville’s run to a title. Smith averaged 18.7 points to go with 3.3 rebounds and 2.9 assists. Smith is considered a bubble first round pick for the NBA, and while he was key for the Cardinals in their run to a title he fits less smoothly into the NBA — 6-foot shooting guards don’t exist in the NBA. He’s probably a second-round pick. Now the question becomes what center Gorgui Dieng will decide to do. His name has been on the NBA radar for the past two years, and a strong tournament seems to have pushed his projection from borderline to solid first-round pick. If he does decide to go pro as well, it will be a major loss for the Cardinals, as they’ll lose the anchor of their defense and one of the best shot-blockers and rebounders in college basketball. Louisville’s four-man recruiting class is especially strong in the backcourt. Terry Rozier was one of the top three point guard prospects in the country this year, while fellow lead guard Chris Jones was arguably the best in the junior college market. Those two now are likely to play immediately. Rising junior forwards Chane Behanan and Wayne Blackshear should both be ready to assert themselves even more next season. Big man Montrezl Harrell is capable of having a breakout season in the middle with more playing time and experience, while wing Luke Hancock provides the perfect complementary piece and proved with his Final Four MOP performance that he can step up when needed. The Cardinals will be the team to beat in the watered-down Big East (Syracuse, Pitt and Notre Dame off to ACC) even if Dieng also leaves. It’s a fitting national championship game on Monday night at Atlanta as Louisville puts the nation’s top defense against the country’s top player in Michigan point guard Trey Burke. The Cards, who have won 15 straight games, opened as 4-point favorites on WagerWeb.com. Check our current lines. The Wolverines are looking for the first national championship since beating another Big East team, Seton Hall, in 1989. UM knocked off Syracuse — also of the Big East — 61-56 on Saturday night despite a rough game from Burke. The recently named Wooden Award winner missed every shot that he took in the second half in addition to a free throw in the final 30 seconds that helped keep Syracuse’s hope of a late comeback alive. Burke entered the game averaging 18.8 points and 6.8 assists while shooting 46.4 percent from the field. But against Syracuse he got seven points and four assists while shooting 12.5 percent from the field. Michigan won in large part because freshman big man Mitch McGary posted 12 rebounds (five offensive) and six assists to go along with his 10 points. Michigan assisted on 17 of 21 field goals (80.9 percent) Saturday, its highest assist percentage in a game this season. The Wolverines are 22-0 this season when they assist on at least 50 percent of their field goals. Louisville beat No. 9 Wichita State 72-68. Louisville junior Luke Hancock, averaging 6.8 points over his previous four NCAA tournament games, finished with 20 points — including 14 in the second half, when the Cardinals rallied from a dozen-point deficit. Wichita State finished with only 11 turnovers, but seven of them came in the final seven minutes. With 8.8 seconds left and Louisville leading by two and looking to seal it from the line, Hancock made his first foul shot, missed the second but forced a jump ball on the rebound, giving his team back possession. A Russ Smith free throw with five seconds left accounted for the final margin of victory. Smith scored a team-high 21 points Saturday but was 6-for-17 (35.3 percent) from the field, his lowest shooting percentage in the 2013 Men’s Basketball Championship. Smith was unable to thrive on easy baskets against Wichita State, scoring four paint points and four transition points, both of which were lows in the tournament. Smith becomes the first player since Shane Battier and Jason Williams in 2001 – and just the eighth since the tournament expanded in 1985 – to record at least 20 points in each of the first five tournament games for a team that played for the national title. In adjusted efficiency rankings, the nation’s most efficient defense in the country is Louisville, which is allowing just .824 points per possession on the season after Saturday’s victory over Wichita State. Michigan is the nation’s No. 1-ranked offense, scoring 1.22 points per trip. The Cardinals have forced opponents to turn it over on 27.3 percent of their possessions this season (and have averaged 47 deflections per game in the NCAA tournament), frequently on the press. Michigan team turned it over less frequently — on just 14.5 percent of its total possessions — than any other team in the country this season. Louisville and Michigan have played two common opponents – Pittsburgh and Syracuse. The Wolverines went 2-0 against that pair while U of L went 3-1. Louisville coach Rick Pitino defeated UM coach John Beilein two of the last three times they’ve met, but both victories required overtime. Beilein coached West Virginia in those games. When Pitino was at Kentucky, he also defeated one of Beilein’s teams at Canisius. Louisville is 2-0 all-time against Michigan but the teams haven’t played since 1978. WagerWeb.com trends: Wolverines are 4-0 ATS in their last 4 games following a S.U. win. Wolverines are 5-0 ATS in their last 5 NCAA Tournament games. Wolverines are 4-0 ATS in their last 4 games following a ATS win. Cardinals are 10-2 ATS in their last 12 games overall. Cardinals are 9-2 ATS in their last 11 games vs. a team with a winning S.U. record. Cardinals are 4-1 ATS in their last 5 games following a ATS loss. Cardinals are 8-2 ATS in their last 10 NCAA Tournament games. Louisville was the No. 1 overall seed entering this tournament and the odds-on favorite, and that is true even more so entering Saturday’s Final Four as the Cardinals are on a 14-game winning streak (taking all but two by double digits) as they face Cinderella Wichita State in Atlanta. The Cards opened as 10.5-point favorites on WagerWeb.com. Check our current lines. Wichita State is the second No. 9 seed to reach the Final Four and the fifth team seeded No. 8 or higher to make it — the previous four all lost by double-digits in the national semifinals. The Shockers received an at-large bid to the Field of 68 after losing to Creighton in the MVC tournament title game. They beat eighth-seeded Pittsburgh in the Round of 64, top-seeded Gonzaga in the Round of 32, 13th-seeded La Salle in the Sweet 16 and second-seeded Ohio State in the Elite Eight to become the first MVC member to make the Final Four since Larry Bird took Indiana State there in 1979. The Shockers have already topped the team that was ranked No. 1 in the AP poll on Selection Sunday (Gonzaga) and the team that won the conference tournament for the nation’s toughest league (Ohio State). Wichita State is holding opponents to 34.3 percent from the field in the tournament. Among those who have played multiple games, only Syracuse (28.9 percent) has kept opponents lower. Pittsburgh, Gonzaga, La Salle and Ohio State have all experienced one of their three worst shooting games of the season against Wichita State. Gonzaga hadn’t shot below 41.5 percent prior to its 35.6 percent effort in the Round of 32. Wichita State doesn’t usually extend its defense in an effort to force turnovers. Instead, the Shockers prefer to stay in front. They challenge shooters well, particularly inside the arc, where they allow just 43.4 percent shooting. WSU isn’t a great offensive team. Carl Hall is by far the best offensive rebounder on a team that typically whose best offensive feature, the only place where it ranks among the top 100 teams in the country this season, is its 38 percent offensive rebounding percentage. Wichita State has been especially lethal late in games offensive, however. It is shooting 58.3 percent in the final five minutes of games in the tournament, up from 40.8 percent the rest of the game. Rick Pitino’s Louisville team has won those 14 straight games by an average of 17.3 points, including four NCAA tournament games by an average of 21.8 points. The Cards are the best defensive team in the nation and they have forced more turnovers (71) in the 2013 NCAA tournament than any other team. That feeds offense, Louisville has scored 72 transition points in its first four games, the second-most in the field. Of those 72 transition points, Louisville has scored 37 (51.4 percent) off turnovers in the tournament, more than any other team in the field. The Cardinals allow only 0.82 points per possession, and also rank second nationally in defensive turnover percentage — with teams coughing it up on nearly 28 percent of possessions against Louisville. Both Russ Smith and Peyton Siva rank among the top 35 in steal percentage. Smith is averaging 26.0 points in the NCAA tournament, as he’s been impossible to keep out of the paint and a terror in transition. But U of L struggles to shoot the ball from beyond the arc. That hasn’t hurt them yet, because no one has been able to keep Peyton Siva and Smith out of the lane. No one in Louisville’s rotation shoots better than 37 percent from 3-point range. Wichita State and Louisville have faced two common opponents this season: Pittsburgh and Northern Iowa. The Shockers beat Pitt 73-55 in the Big Dance opener and split two regular-season meetings with MVC co-member Northern Iowa. Louisville beat Pittsburgh 64-61 and Northern Iowa 51-46. WagerWeb.com trends: Shockers are 4-0 ATS in their last 4 neutral site games. Shockers are 5-1 ATS in their last 6 Saturday games. Shockers are 4-1 ATS in their last 5 games following a S.U. win. Shockers are 6-2-1 ATS in their last 9 vs. Big East. Cardinals are 4-0 ATS in their last 4 Saturday games. Cardinals are 10-1 ATS in their last 11 games overall. Cardinals are 9-1 ATS in their last 10 games vs. a team with a winning S.U. record. It’s the first meeting of No. 4 seeds in NCAA Tournament history on Saturday night at the Final Four in Atlanta as Michigan looks to return to the national title game for the first time since the Fab Five days and SU looks to get back for the first time since winning the school’s only national title in 2003. The Wolverines opened as 2-point favorites on WagerWeb.com. Check our current lines. Michigan has won three of its four NCAA Tournament games rather easily but needed a miracle rally to beat Kansas in the Sweet 16. UM then smacked No. 3 Florida 79-59 to reach the Final Four. Michigan guard Nik Stauskas was 5-for-5 on 3-pointers and 6-for-6 overall in the first half, and the only thing he missed in the opening 20 minutes was one of his free throws, when he got fouled on a 3-pointer at the halftime buzzer. He finally missed in the second half — once — and finished with 22 points on 7-for-8 shooting. Florida’s defense had been allowing foes to shoot only 37.9 percent overall and 30.3 percent from 3-point land this season. But Sunday, the Wolverines dictated tempo and made 47.5 percent of their shots, including half of their 3-pointers. Trey Burke was responsible for 40.5 percent (32 of 79) of Michigan’s points against Florida, scoring 15 and having his seven assists lead to another 17. In Michigan’s four tournament games, Burke has been responsible for 134 points, most in the tournament field. Burke was named the AP Player of the Year on Thursday. Michigan scored a season-high 28 transition points in its win against Florida. The Wolverines previous season high was 27 transition points set in their win against VCU in the Round of 32. The Wolverines are now 11-1 when they score at least 20 transition points, with the one loss coming at Indiana on Feb. 2. With four wins in this NCAA tourney, the Wolverines already have more tournament victories than their total (three) from the end of the Fab Five era to this season. They won a game in 1998, and then didn’t even make the field again until 2009. As a team, the Wolverines commit the fewest turnovers (9.4 per game) and the second fewest fouls (12.7) in the nation. But Michigan’s big men are poor foul shooters. Mitch McGary shoots 45.7 percent and Jordan Morgan hits on 53.8 percent. Syracuse coach Jim Boeheim is in his fourth Final Four — and he’s 3-0 in his previous national semifinal games and 9-0 in his career against UM coach John Beilein. The Orange lost four of five to close the regular season but reached the Big East Tournament final, where they blew a 16-point second-half lead and lost by 18 to Louisville. The Orange’s vaunted 2-3 zone has been terrific in this tournament, allowing less than 46.0 points per game. In the Elite Eight, SU beat Marquette 55-39. Marquette shot only 22.6 percent, turned the ball over 13 times and recorded its fewest points in a game this season. The Golden Eagles’ 39 points were a record low for a team in an NCAA tournament regional final since the shot clock was introduced in 1986. Syracuse outscored Marquette 19-0 on points off turnovers. SU is averaging 6.5 blocks and 10.8 steals, while forcing opponents into 29 percent shooting, including 15 percent on 3-pointers in this tournament. 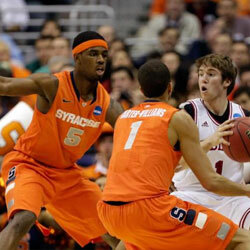 Top seed Indiana also scored its fewest points of the season in the Sweet 16 loss to SU. Limiting Michael Carter-Williams and Syracuse’s fast-break attack could be key for the Wolverines. The Orange weren’t exactly the fastest team in the country this season — they ranked No. 244 in Pomeroy’s adjusted tempo — but you really do not want to see them on the break. According to Synergy scouting data, Syracuse averaged 1.12 points per trip in transition this season, disproportionately more than in the half court. WagerWeb.com trends: Wolverines are 4-0 ATS in their last 4 games overall. Wolverines are 4-0 ATS in their last 4 neutral site games. Wolverines are 4-1 ATS in their last 5 vs. Big East. Orange are 5-2 ATS in their last 7 neutral site games. Orange are 1-5 ATS in their last 6 Saturday games. Both Iowa and Baylor believed they deserved to get an NCAA Tournament at-large bid but were denied by the selection committee. 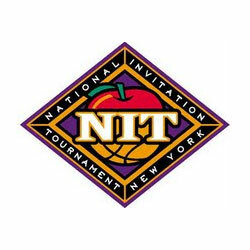 However, either the Hawkeyes or Bears will get to end their season with a win and a nice consolation prize as they meet Thursday night in the NIT Championship Game in New York. The Hawkeyes, of the Big Ten, advanced with a 71-60 win over Maryland on Tuesday. Roy Devyn Marble had 21 points and nine rebounds to help Iowa reach the National Invitation Tournament championship game for the first time. Iowa (25-12) won for the 11th time in 14 games. Senior and captain Eric May finished with 12 points, his last on a big 3-pointer with 1:01 to play that iced it for the Hawkeyes. Iowa scored 27 points off 17 Maryland turnovers, its most points off turnovers in a game this season and tied for the most such points Maryland has allowed this season. The Terrapins scored two points off turnovers, tied for both the fewest such points they have scored and the fewest Iowa has allowed in a game this season. Iowa won its 25th game of the season, which is tied for second most in program history. Marble scored at least 21 points and led the team in scoring for the fourth consecutive game. He tallied his 11th game of the season with at least 20 points, and 13th of his career. Marble has scored 97 points in the NIT (24.25 ppg.) this season. Iowa has now won 11 of its last 14 games. Baylor beat BYU 76-70. Pierre Jackson earned himself and Baylor another game, putting up his third straight double-double with 24 points and 10 assists to lift the Bears back into the National Invitation Tournament championship. Baylor’s Cory Jefferson scored 21 points and Isaiah Austin had 14 points and 10 rebounds for the Bears, who are in the championship for the second time in five years after losing to Penn State in 2009. Baylor has won 20 of 21 and 41 of its last 43 games when leading at the half over the last two seasons. Baylor is 14-0 when scoring 37+ points in the first half and 7-14 when scoring 36 or fewer points in the first 20 minutes. This will be a matchup between one of the best offensive teams in the country and one of the best defensive teams. Baylor entered Tuesday night’s game ranked 21st in the nation in scoring, at 76 points per contest. Iowa was ranked 18th in defensive field goal percentage, at 38.8. Both these teams dealt with disappointment this year. Baylor was picked to finish second in the Big 12, but ended up in sixth. Iowa finished ahead of Illinois and Minnesota in the Big Ten standings, yet those schools went to the Big Dance, while the Hawkeyes were left out. Baylor is making its 5th postseason appearance in the last six years (2 NIT, 3 NCAA) — BU made only seven postseason appearances in the program’s first 101 seasons (3 NIT, 4 NCAA). The Bears and Hawkeyes each played Iowa State this year. The Cyclones lost 80-71 at Iowa on Dec. 7. and were 2-0 against Baylor, winning by eight and seven points. The first postseason college basketball champion could be crowned on Wednesday night if Santa Clara can beat George Mason in Game 2 of a potential three-game finals in the College Basketball Invitational. However, the Patriots are WagerWeb.com favorites to extend the series to a deciding third game, which would be Friday at GMU. Check our current lines. Santa Clara (25-11) won Game 1 at home 81-73 on Monday. Kevin Foster scored 28 points, Evan Roquemore added 20 to lead the Broncos. Marc Trasolini had 17 points and Raymond Cowles III scored 10. Foster shot 7 for 15 from the field, including 5 for 11 on 3-pointers, and 9 for 11 on free throws. Foster has made 424 this game career threes and he moved to No 5 all-time in NCAA history. He passed the Golden State Warriors’ guard Stephen Curry (414, Davidson, 2006-09) to take over the No. 5 spot. He needs seven to move past former Tennessee All-American Chris Lofton (430, 2005-08). It was the eighth consecutive postseason win for the Broncos. Santa Clara has won 25 games for just the second time in the 106-year school history of basketball; and 24+ games for the second time in three years under Coach Kerry Keating, having won 24 in 2010-11 when the Broncos won the CIT. It is the second time in three years and just the third time in 17 years that Santa Clara has played in the post-season. It is the 17th post-season appearance in school history (22-17: 11-13 NCAA; 2-4 NIT, 5-0 CIT, 4-0 CBI). Jonathan Arledge had 23 points to lead George Mason (21-15). Patrick Holloway scored 17 points and Bryon Allen had 15 points and eight assists. Redshirt junior Sherrod Wright set a new school record with his 36th start of the season for George Mason, breaking the single-season mark shared by Lamar Butler and Will Thomas during the 2005-06 season. Wright is the only Patriot averaging double-figure points this season at 16.5 per game. SCU has won three of the previous four meetings with GMU, including the last three. SCU won 78-76 in OT on Dec. 29, 2000 in the first round of the Cable Car Classic and added a home win, 65-58, on Jan. 2, 1992. George Mason won its first on its home floor, 69-67, on Dec. 9, 1989. Santa Clara won 21 regular season games for the first time since 1994-95 and their nine-game improvement in conference play, going from 0-16 last year to 9-7, is the second-best single-season turnaround in WCC history. The Broncos fell one victory shy of tying the all-time league mark, established in 1988 by LMU. 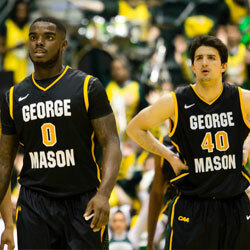 George Mason was 10-6 at home this year (5-9 ATS) while Santa Clara was 9-5 on the road (9-5 ATS). George Mason will join the Atlantic 10 Conference in July, leaving the CAA. WagerWeb.com trends: Broncos are 6-0 ATS in their last 6 non-conference games. Broncos are 4-0 ATS in their last 4 games overall. Broncos are 4-1 ATS in their last 5 games following a S.U. win. Broncos are 4-1 ATS in their last 5 games following a ATS win. Patriots are 2-5 ATS in their last 7 games vs. a team with a winning S.U. record. Patriots are 2-5 ATS in their last 7 home games vs. a team with a winning road record. Patriots are 2-7 ATS in their last 9 home games. Baylor was expected to compete for the Big 12 title this season but was a massive disappoint. However, the Bears can earn a trip to New York for the NIT semifinals with a win over Providence on Wednesday in what is likely to be the Friars’ final game as a member of the old Big East Conference. Baylor opened as an 8-point favorite on WagerWeb.com. Check our current lines. Providence advanced with a 77-68 win over Robert Morris, the team that upset top-seeded Kentucky in the first round. Vincent Council scored seven of his 12 points in the closing 5:21, including a key 3-point play on his only basket of the game, to carry Providence to the win. 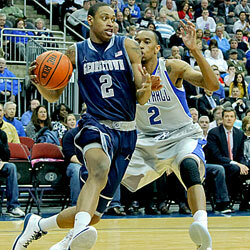 LaDontae Henton led the Friars (19-14) with 21 points and Bryce Cotton had 20. Council added 10 assists and was 10 of 13 from the free-throw line despite shooting 1 of 9 from the floor. 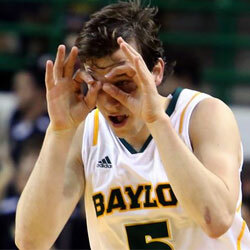 Baylor beat Arizona State 89-86. Pierre Jackson had 26 points and had 16 assists, Cory Jefferson added 21 points, Brady Heslip had 14 and Isaiah Austin 13 for Baylor (20-14). Jackson, who was 17 of 21 at the line, made six of eight free throws in the final 55 seconds. Jackson’s 16 assists on Friday vs. Arizona State were the most in the NIT’s 76-year history. Despite having an all-Big 12 point guard in Jackson and a potential top-10 NBA pick in 7-foot freshman center Isaiah Austin, Baylor struggled to a 9-9 finish in the Big 12. The Bears lost six of their last eight games and were knocked out of the Big 12 tournament in the first round. The Bears are 12-4 in postseason play under Scott Drew and have won multiple games in each of their last four postseason trips, losing to the eventual tournament champions each of the last three times entering this season. Baylor has advanced to the quarterfinals in each of their last four postseason tournaments – the Bears went to the 2009 NIT finals and the 2010 and 2012 NCAA Tournament Elite Eight. WagerWeb.com trends: Friars are 3-8 ATS in their last 11 road games following three or more consecutive home games. Friars are 1-3-1 ATS in their last 5 games vs. a team with a winning S.U. record. Friars are 0-5 ATS in their last 5 vs. Big 12. Bears are 4-1 ATS in their last 5 Wednesday games. Bears are 10-21 ATS in their last 31 games following a S.U. win. Bears are 5-12 ATS in their last 17 home games vs. a team with a road winning % of less than .400.